Shortly after returning to Mexico in 2005, a large, dual axle truck who had just delivered several tons of tomatoes to Mexico City’s food distribution center (central de abastos) hit us squarely in the back, as we were sitting at a red light. He driver accepted responsibility. We received about $1400 from the insurance company, and were able to fix the very banged up back doors for about $200, using the rest to help put a down payment on a church building. In 2008, after a concert by Lighthouse Collective and Eric Fritts, a college group from Woodside Bible in Michigan, we were on our way home at around midnight. A large microbus smacked into us at a speed bump, and took off, a classic hit-and-run. I floored the van and caught up with the guy at the next red light. After some persuasion the half-drunk driver gave us about $50 for the accident. 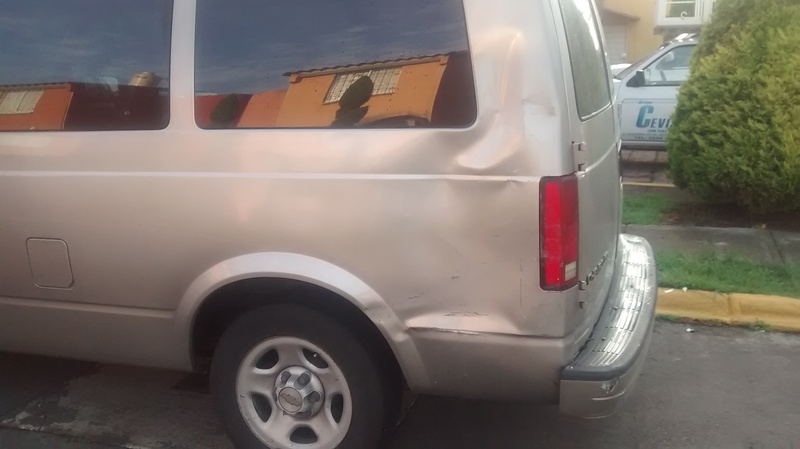 It cost about $90 to fix the back of the van, and eventually required a new bumper. On Christmas Day, 2010 (I think), we were headed to northern Veracruz, and an SUV came into our lane from the opposite direction. To avoid a head-on collision, I swerved, resulting in our big van riding on one front tire, then the other, finally spinning 360° on dry concrete. Wow. During the slide, amidst the sound and smell of burnt rubber, the van shut off, as we hurtled down a long grade. We were shaken up, but us and the van were fine. On the way up to Rio Grande Bible Institute this past March, the top leaf of the spring on the drivers side came within a quarter inch of rubbing against the inside of the tire. We detected the problem after driving nearly 3 hours, at a high rate of speed. $15 and 45 minutes later we were back on the road, driving the remaining 12 hours to TX. You can read more about that HERE. Just Friday, I was turning out of a neighborhood on to a main road. It was raining. The nearby red light had backed up one lane of traffic farther than I had initially estimated, causing me to take additional time in getting around the last vehicle. Oops, a large box truck, used to transport water, smacked into the back of the van, knocking us up into the medial strip. I controlled the van, jumped out and paid the truck about $67 for any repairs they might have had. It will cost me $80 to get this bump pounded out. My body work guy, Luis, is now a personal friend. We joked that this might be the only spot in the van that he hasn’t already repaired. In all of these events, in each and every moment we have experienced God’s watchful care over us. In every single case. A dependable vehicle is important for what we do. A gracious and powerful God is even more important.